Emotions and mental health aren't things I paid much attention to for a long time. I've had a fairly privileged life in most ways, always with a home, food, and a caring family, and was able to attend university and save money myself for travel. I always thought yes, mental illnesses are real and serious and can affect people's lives in large ways, but they're something that happens to me. I felt one step removed from that entire topic. But having all these things that I have, does not necessarily equate happiness, and we all need to remember that. Anyone who has read this blog in the last few months will know that I recently moved from South Korea back to Hong Kong. There were various reasons - my full story is here - but they all culminated in me being deeply, deeply unhappy. I do not believe I had, or have ever had, a mental illness, as I wasn't exhibiting symptoms serious enough to call it that, but I was starting to worry that I was heading in that direction had I stayed, possible ending up with anxiety and/or depression. I've always been a worrier anyway. I've never called it anxiety, and I don't really know if it is or not, but for as long as I can remember, I've worried and stressed about little things that really don't matter or that I can't control. I thought I'd gotten more relaxed over the years, but I actually just think the subject matter of my stress has changed, and I've gotten better at disguising it. It's always been manageable though, up until those last few months in Korea. I developed chronic insomnia and pustular psoriasis on my hands (hereditary in my family, but had never shown itself in me before). I hardly wanted to socialise, but not doing so made me lonely and even more miserable. My skin was breaking out in spots, I hardly cared about wearing makeup or putting much effort into my appearance for work day-to-day (which is definitely a worrying sign for a sometimes fashion blogger!) towards the end. And I experienced what I can only assume was my first anxiety attack - heart racing, shortness of breath, clenched muscles, tears, and an overwhelming emotional overload. This is certainly not as bad as what I know some people with serious mental health problems experience, but it was all new and horrible for me, so I knew change was needed to be happier again. I've definitely felt better since returning to Hong Kong - all my physical symptoms are more or less gone (we'll not dive into everything my brain thinks right now!). But nothing is perfect, and after those experiences, I wanted to start paying more attention to my mental health, to avoid repeating those months. For instance, work needs to stay at work. But natural worrisome tendencies cause me to overthink and stress about tiny things, which are often (though not always) work related, and I used to talk about work a lot - though not necessarily the things causing the stress. Now, I want to avoid talking or even thinking about it too much when I'm not there, and I never bring any work home. I definitely don't love my job, but it's temporary and a means to an end. I've also realised that while it can be tempting to stay at home at the weekends sometimes, those tend to be the days I get trapped overthinking in my own head, and feeling lonely, so it's better for me to go out and do something, even if it's just running errands, or writing from a café, as I'm doing now. Then, I also saw the idea for this mood chart online, and I ended up downloading a mood tracker app as well, to monitor how I feel and what may be causing those feelings. 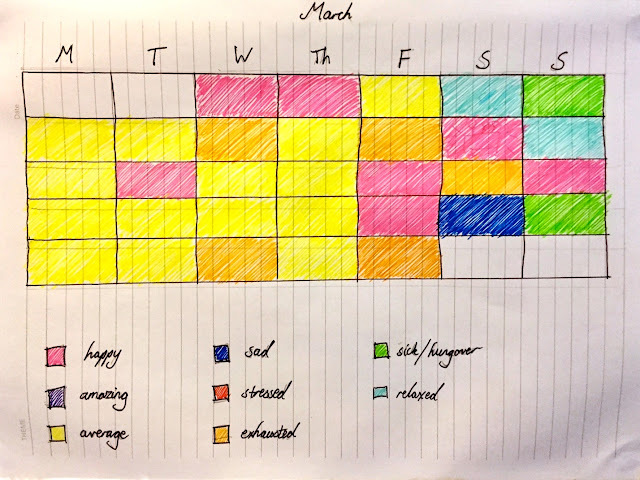 The chart is just a case of colouring in each day based on what my general mood was for the majority of the day. I can add whatever moods I need to my list, and it's simple to read as an overview of each month - and the colours make it bright and fun! It lacks much detail though, which is where the app, 'Daylio', comes in. I can add multiple data points for each day, and it averages those to give the overall mood, which is entered on the monthly graph. There are only 5 mood options though, in a ranking of best to worst, so my chart allows more flexibility there. The app also lets you enter what activities you've been doing, which is my favourite feature. You can use theses as filters on the graph, to track trends in how different activities affect your mood (though as I've discovered, there's no set patterns, sometimes emotions strike without warning!). Neither version is perfect, but using both lets me keep track pretty well I think. As you can see, it's not been a bad month, and I'm pleased at the minimal amount of red (stressed) and dark blue (sad) on here. My app graph never dips below level 3 (average) either. Though remember, these are general daily moods - it doesn't mean there haven't been low moments within each day, they just haven't overwhelmed the whole day. But although there's little bad, there isn't whole lot of really good either - no purple (amazing) or level 1 (great) days. Everything has been average. I feel like I'm plodding through each day, nothing going wrong, but I'm tired and more than a little bored. I feel fed up, and borderline apathetic sometimes. I don't love my job, and it leaves me too tired to want to do much with my evenings. Sometimes the weekends are more fun, but they're too short when I work a Saturday, and let's not dive into my other social issues affecting my free time right now! I wrote another post on this topic of average and ordinary recently - you can read it here. So these tactics have been good at helping me think about my moods, and see that things are better than they were. But they've also made me see the average-ness of everything right now, which doesn't feel great. I'm hopeful that it's temporary - I'm more than fed up at work, but after July I'll be finished and hopefully on to new adventures. That's no guaranteed 'fix' of course - I don't think anything really is for these sorts of issues - so I'm going to keep monitoring myself for now, and try to make little changes and improvements when possible. Getting out the house, leaving work at work, treating myself sometimes, not being as hard on myself, reflecting on the good things more often - I'd like to start yoga again, but there's no space at home really, so I'll have to figure something out for that one! All in all, mental and emotional health is something we all need to be aware of, wherever we rank on the spectrum, and be more open talking about it (as a person who doesn't open up emotionally very often, this is definitely something I should work on) - it matters!